In this volatile and complicated time, the value of taking a number of different approaches simultaneously to solving difficult problems has increased in intensity. This mindset has become more critical. Today, companies are operating in an era where problems have become more complex, the tempo faster, the markets more volatile, and the stakes higher. Let us take a look at the Flexons Approach. The Flexons Approach to Problem Solving is the basic framework that allows companies to develop innovative solutions. What Is the Flexons Approach? Flexons are flexible objects for generating novel solutions. It is not a silver bullet for solving any problems. But it provides a way of shaping difficult problems to reveal innovative solutions that are often not revealed or unearthed in the process of problem solving. Companies often tapped experts of various disciplines to generate diverse solutions to problems. But, in reality, not all companies have think thanks at their disposal. 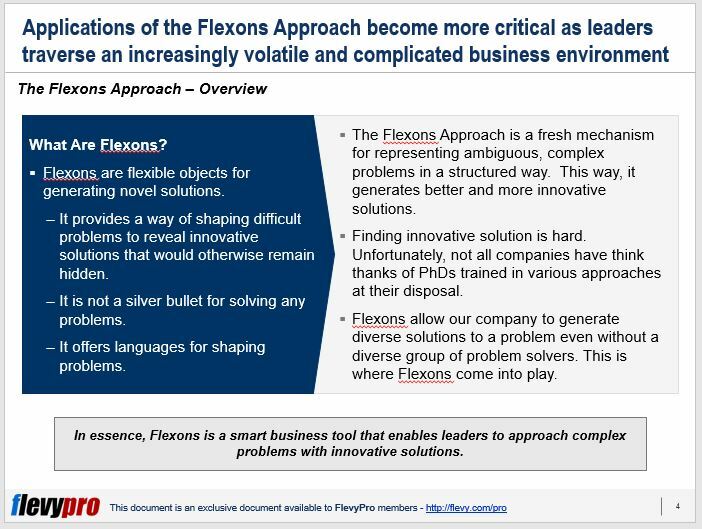 For companies that do not have a diverse group of problem solvers, the Flexons Approach can be their small business tool to approach complex problems with innovative solutions. The dynamism of the Flexons Approach can be seen when complex and ambiguous problems are arranged in an organized manner. When this is done, innovative solutions are better created because problems become clearer and defined. To accommodate the world of business problems, 5 types of Flexons have been identified. The 5 Flexons are problem solving languages that can deliver effective optimal solutions. 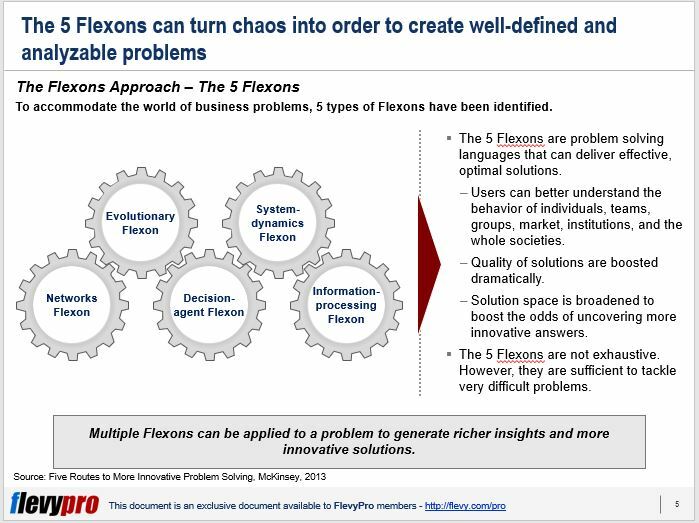 Using the 5 Flexons, order is established in a chaotic field of problem solving. Problems are turned into well-defined and analyzable problems thus enabling companies to better come up with innovative solutions. The 5 Flexons deepen the users understanding of the behavior of individuals, teams, groups, market, institutions, and the whole societies. This way, quality of solutions is boosted with solution space being broadened to come up with innovative answers. A Network Flexon focuses on a group or system of interconnected people or things. This situation is decomposed into interrelated problems of prediction and optimization. This can be used by pharmaceutical companies that are about to launch a product. To successfully achieve their goal, a network map of physicians can be created to influence drug usage. With Network Flexon, the company can target clusters of physicians who share the same ideas and have close interactions. 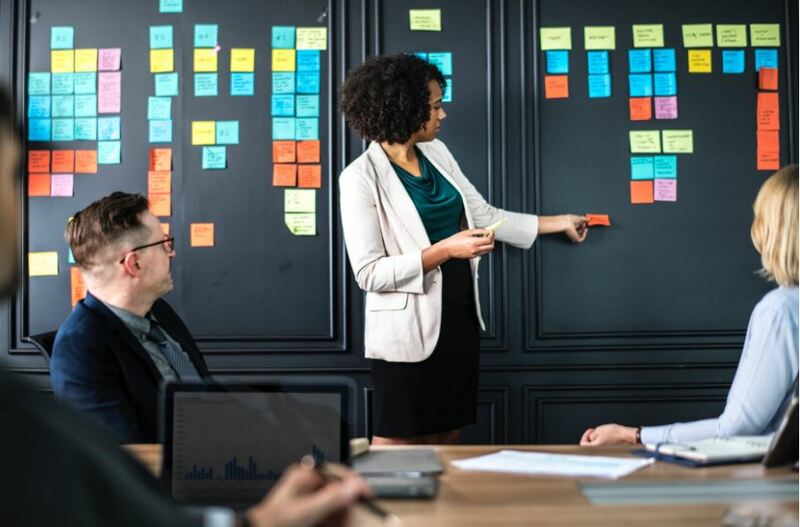 Evolutionary Flexons are very effective in market research where companies need to determine if a certain brand would be a hit or an expensive failure. A series of low-scale product experiments may be done using the Evolution Flexon. The basic approach of Decision-agent Flexon is to determine the right level of analysis of firms. It determines the combination of strategies that can be collectively used. The Decision-agent Flexon can be used by an industrial company that wants to maximize its manufacturing footprint. Using this approach, the company can assess the payoffs and the strategies proposed by multiple stakeholders. The System-dynamics Flexon looks at effects of decisions made. Often, when finding solutions, it can be a challenge to assess the decision’s cascading effects on complex businesses. When given solutions are just too many, finding the right decision can be difficult. The System-dynamics Flexon sheds light on a complex system. It helps companies develop a map of the causal relationships among key variables. The Information Process Flexon is the one that provides a lens for viewing various parts of a business as information-processing tasks. In organizations, this device is a collection of people, whose processes for deliberating and deciding are the most important explanatory variable of decision’s effectiveness. The multiple use of Flexons can result to companies optimizing their strategic results to gain competitive edge. The Flexons Approach can be the company’s framework to innovative solutions. Let us look at the case of a large biofuel manufacturing company that needs to design a better innovation network. The large biofuel manufacturing company opted to use the Networks Flexon, the Evolution Flexon, and the Decision-agents Flexon. By using multiple types of Flexons, the large biofuel manufacturer was able to illuminate the problem from very different angles. This paved the way to developing a more innovative and fresh solution never thought of and tried before. The Flexons Approach gave the company the needed business tool to approach complex problems and come up with solutions that are more applicable in today’s highly competitive business world. Interested in gaining more understanding on how to approach problem solving using the Flexons Approach? You can learn more and download an editable PowerPoint about Flexons Approach to Problem Solving here on the Flevy documents marketplace.